November 16, 2014 November 17, 2014 / Miriam L.
My mom made applesauce every fall when I was a kid. Her recipe is simpler than mine because she uses a food mill to separate the seeds and skins after the apples have boiled down. Personally, I prefer a chunkier applesauce, which means that I opt out of using the food mill, but have to go to the trouble of peeling and coring my apples ahead of time. For me, though, it’s worth it. Apples are naturally high in acid, which means that applesauce can safely be canned in a boiling water bath. If you don’t want to go through the process, it freezes well (this is what my mom does), or you can keep it in the fridge to eat in the next few weeks! If you plan on canning your applesauce, take a look at Option 2 below and get your water bath canner set up ahead of time. You need your jars to be hot by the time you’re ready to fill them. Peel and core the apples, cutting into 1/2 inch cubes. In a large stock pot, combine the apples, water, lemon juice, and spices. Bring to a boil on high heat, then reduce heat and simmer until the apples soften, about 30 minutes. Once apples are softened, use a potato masher to get desired consistency. 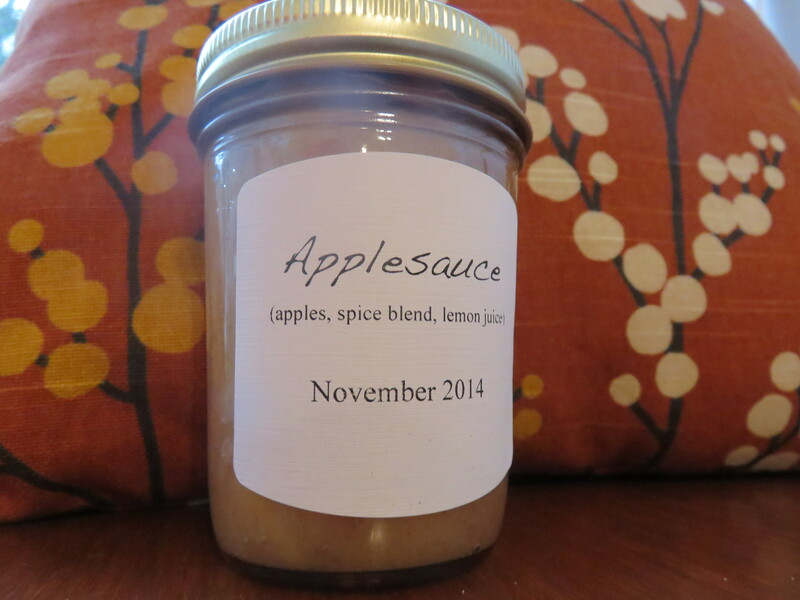 If you don’t want to can the applesauce, just put it in storage containers and place in the fridge or freezer. If you are freezing, make sure to leave enough space at the top of the container for the contents to expand. Also, remember to label your containers, especially if freezing. I’ve found that frozen applesauce and chicken broth can look pretty similar at first glance. Marisa McClellan over at Food in Jars has a great guide for beginning water bath canning. I highly recommend reading through her directions. This recipe makes about four 8 oz. jelly jars or two pint jars. For canning, funnel the applesauce into the jars, running a chopstick around the edges to get out any air bubbles. Leave a quarter to half inch of head space. Wipe the rim of the jar with a damp paper towel to remove any applesauce that might have spilled while filling. Using two part lids, tighten to “fingertip tight” (i.e. until you just start to feel resistance — if the lid is too tight, the air can’t escape to create a vacuum for a strong seal) and process 10 minutes for 8 oz. and 15 minutes for pints. 1. I like my applesauce fairly spiced, but you are welcome to adjust the spices to your preference. Unless you dump an entire jar of cinnamon into the pot, the spices won’t affect the recipe’s acidity level enough to be a problem for canning. 2. You’ll notice that I didn’t add any sweetener to my applesauce. That’s a personal preference. You are very welcome to add a preferred sweetener if you would like. Honey or maple syrup might be a nice addition. I’ve never canned with sugar substitutes, but for something like applesauce, where you’re not trying to get the finished product to gel, I think they would be fine, as well. ← What is all this?